On 21 March 1918 the German Army launched a large-scale offensive against the Allied front on the Somme battlefield. The offensive is known as the Kaiserschlacht or the Kaiser's Battle. The offensive on the Somme battle sector was codenamed Operation Michael. It was the first of several German large-scale attacks made against the Allied line on the northern part of the Western Front in the spring of 1918. With 72 German divisions in positions ready to attack in three waves, thousands of infantrymen from three German Armies (Seventeenth, Second and Eighteenth Armies) left the German Front Line after a five hour artillery bombardment by over 6,600 artillery pieces. Some 3.2 million shells were destined to land on the British-held front during that first day of the attack. To the German's advantage there was fog in the Somme battlefield sector, enabling the infantry to appear in the British forward positions without being seen to have left their German trenches. The southern part of the British front held by the British Fifth Army was successfully broken by the German Eighteenth Army and the left wing of the German Second Army. The German troops advanced through the British Battle Zone in the forward area of the British Front Line. In a change to the original plan, General Ludendorff decided to reinforce the sector of the attack on Operation Michael's left wing which was reported to be making good progress. The Official History of Australia in the War of 1914-1918 provides a detailed account of the actions at Villers-Bretonneux by Australian units is available to read free online. To read more follow this link. On 24 March the long range, 256 ton German gun called “Kaiser Wilhelmgeschütz” fired its first shells from the Forest of Coucy. With a range of 75-80 miles the shell reached Paris. There were three of these huge railway mounted guns in the forest; the breech blew off when the second gun was fired. The third gun began firing towards Paris on 29 March. The German advance by the three armies continued during the few days after 21 March, but gradually the troops began to tire, having been on the move without relief for four days. Added to this, the supply of food, equipment, ammunition and horse fodder became problemmatic the further the infantry advanced ahead of their supply columns. The ground over which they were advancing was cratered with shell holes, roads were badly damaged and the villages they passed through were wrecked. Ironically, the German Army had been responsible for causing deliberate damage to this area when it made a withdrawal to the Siegfriedstellung (called the Hindenberg Line by the British) in the early months of 1917. The wilful destruction included poisoning of wells. By 29 March the Germans had captured several key Allied-held towns on the Somme battlefield: Péronne, Ham, Noyon, Roye, Montdidier, Albert and Bapaume. The loss of the latter two was especially bitter for the British, given that they had struggled through the summer of 1916 to advance to Bapaume and many thousands of lives had been lost to capture this town. Within a few days in March of 1918 the ground was once more in German hands. On 30 March General Ludendorff issued orders that the next phase of the German offensive, Operation Georgette in Flanders, would be carried out and artillery was to begin moving from the rear of the Operation Michael area to Flanders for the artillery's preparatory bombardment. The next day, 31 March 1918, General Ludendorff chose to rest the troops fighting in the Somme sector for a couple of days with a view to resuming the advance of Operation Michael. However, by 4 March the French Army had begun to reinforce its positions with extra reserves to hold back the German Eighteenth Army south of the Somme river. American troops were beginning to arrive on the battlefront. The British and Australian forces put up a successful defence at the village of Villers-Bretonneux against units of the German Second Army. Strong Allied counter-attacks prevented further progress by the Germans to the city of Amiens. Some German commanders now considered that Germany's last chance to strike a decisive blow against the British had passed. The shortages of reserves, ammunition and horses made it impossible to consider launching another offensive in this sector on such a large-scale. On the evening of 5 April General Ludendorff sent out a message to say that Operation Michael was terminated. Although the Germans had gained over 1,000 square miles of Allied-held territory in a few days, the casualties suffered by the Germans is recorded as 31,000 killed, 20,000 missing and 190,000 wounded. The German offensive resulted in 160,000 Allied casualties killed or wounded and 90,000 men taken prisoner. By the end of Operation Michael the German troops were generally dispirited and disorganized. 14. Band (Volume XIV): Die Kriegführung an der Westfront im Jahre 1918. + Beilagen. Pozières Memorial to the Missing at Pozières Cemetery on the 1918 Somme battlefield. 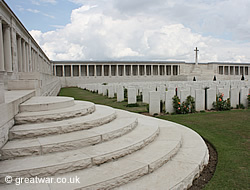 The Pozières Memorial commemorates the names of 14,655 casualties of the United Kingdom and 300 of the South African Forces who died on the 1918 Somme battlefields from the dates of 21 March to 7 August 1918 inclusive.